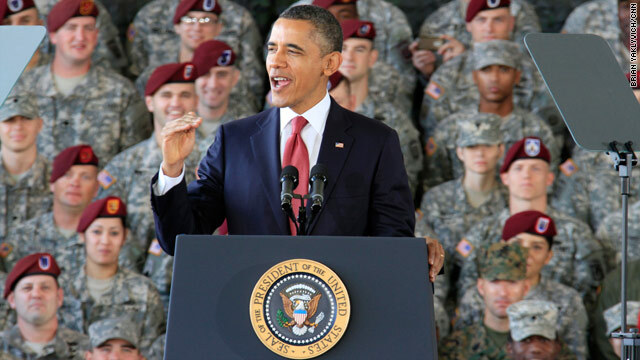 President Obama is scheduled to deliver remarks on the military's Defense Strategic Review at the Pentagon on Thursday. CNN Pentagon Correspondent Chris Lawrence reports that the review "sets forth potentially big changes in U.S. strategy, including the removing up to 4,000 troops from Europe and downsizing the overall ground forces even further." Read Chris Lawrence's complete story on CNN's Security Clearance blog. Hahahaha...Now we know why the administration was pushing for "jobs bill" to help veterans, because they are cutting military benefits and numbers...but hey at least companies can get their tax break for hiring a veteran and then laying them off afterwards. Libtards Rules! and the focus goes to Asia...who is that China who owns much of ou debt or N Korea that is no threat? The middle east is on fire what about that obama? Another pro muslim anti-American political move... NObama 2012! Your lack of education is showing. Although East-North Africa and the middle east have the largest number of Muslim majority countries their percentage of Muslims is 20% of the world total. The countries with the highest Muslim populations are in Asia which has 60% of the world Muslim population. That is roughly 2/3rds of the world's population of Muslims. Asian countries like Indonesia, India, Bangladesh, and China. China has more Muslims than Syria, Russia has more Muslims than Syria and Jordan combined. As for Pakistan, it is considered by some to be in Asia and by some to be in the Middle-east. As for N. Korea it is not beyond reason to think (as screwed up as they are) that they could be a direct threat to us with the right missiles. Who do you think we should believe ....what the U.S. military is proposing, or what you in your ignorance proposes? jean..you are correct, I miswrote. 60% of the world muslim population live in Asia....however, they are considered to be on the periphery of the muslim core. The real threat from muslims is in the middle east and parts of africa. By the way from your posts here and previously I have to ask...are you an angry single black woman? You seem like it. @geraldine....as I have told you many times but you play dumb. I am a white 76 year old great-grandmother of 4, who has been married to the same husband for 57 years. Maybe you should rethink where some of the people who planned the World Trade Center have past history, and you should also take another look at the bombings in Bangkok, March 11, 1994, and the recent bombing in Mumbai. I would say even with serious cuts we will still have the biggest stick. Currently we spend 6 times more on arms than China ( the second largest spender). Our arms spending has doubled since 2001. We spent $698 billion last year which is an increase of 81% since 2001, and we spent 4.8% of our GDP last year on arms. It is time to reign in weapons spending which is the biggest deficit gorilla in the room and spend some of that money on the home front.. Frankly this has been a long time in coming, and thankfully this president is getting it done. last spring the UK stated publicly they do not have the ability to fight a war on their own. If you recall we have had other leftist nuts who cut our military to shameful levels...Carter and Clinton...actually there is much evidence clintons distain for the military and intel agencies are the core reason we had a September 11th.... he was busy with Lewenski while the military struggled in somalia and on and on... here we go again. The muslims in asia don't seem to be a problem to us... I believe we are changing the focus from the middle east to asia because that is where the economic growth is...ie...our interests. This is about big money...not keeping America safe, or stabilizing the middle east....no moral imperative here, obama got his marching orders! The great uniter. Do Not be mislead that N. Korea is not a threat that war is not over. China has many Centuries of distrust of Japan and would East is the reason the terrorist target us. Let the Muslims take care of their Nations we don't need to be the world's Policeman. obama did do a killing in Libyia....I guess this back seat kind of illegal killing of other countries leaders is ok...correct? Oh, can you tell me why obama did this...exactly? well...I guess September 11th, 2001 is a long distant memory to you. The day radicals started killing Americans on American soil. You had better hope our military stays strong. @geraldine I think I can remember where I was that day as well as anyone else, plus I can remember Pearl Harbor, the D-Day, V-E Day, the day the bomb was dropped on Hiroshima, the Korean War, the fall of Saigon. I also have the good sense to know that we can not afford to keep building arms at the current rate. Plus, with the arms we currently have we are still the big kahuna on the world stage of being arms ready. That and I doubt very much that the few cuts being proposed will put us in any danger. Actually I think the Republicans even want to cut it more. Basically, I see you as a fool that adds nothing to the discussion. what I wonder is if my husband will still have a career after all this wonderful planning by Obama. Seeing as all he's ever wanted was a life in the military and now we don't even know what the list is for who is being "cut" . As for the money we spend on arms each year?? My husband was shot at and blown up enough to know that ENOUGH wasn't spent at least not that got to him and his guys last year. Getting out of dodge once the job is done is a great idea, you can't go into a country, make a big mess and then just LEAVE when it costs too much or it's not popular anymore and then take away the careers so many count on while there still aren't enough jobs for those who don't even have one yet. Sounds like a stellar plan to me! Frankly I doubt that a 8 to 10% cut over 10 years is going to make a dent in our bloated beyond reason defense budget, nor will it end that many military careers. Most military retirements will be from attrition. As for leaving Iraq, do you not know that the Iraqis asked that we leave? After 10 years I think it was about time we leave....especially when asked to leave. As for planning that war in Iraq for non-existent weapons of mass destruction (WMD) I don't think you can look to the current president for creating that problem. Or for the problems caused by the amount that it cost. Currently we are saddled with an over the top defense spending budget that costs us more than the next 16 nations combined.. As for President Obama planning this I understand Republicans would have been forced to the same cuts, and may have agreed to more. This is not the first nor will it be the last time we have cut defense spending...thankfully thought we are doing it. You may have missed this article in the Denver Post which sums up much of the problem. A drawdown in the military was inevitable with this President. If he was truly serious about getting the deficit under control, he would start eliminating the excess bloat he put in place (CZARS, Obamacare, Money for governments who hate us, Money for Mosques, etc.). Quit caring about being reelected and be the President. Make the difficult choices, quit blaming others for the state of the Economy. It goes with the job.